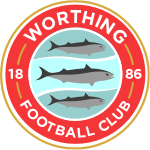 Worthing eased to a comfortable win over a shot-shy Hornchurch, who were only prevented from suffering a heavier defeat by a Man of the Match performance from goalie, Callum Chafer. Modelling the latest line in C&A’s “ Carpet Slippers and Pipe” range, Manager Adam Hinshelwood stuck with the same team that took to the pitch in the wins over Whitehawk and Folkestone. 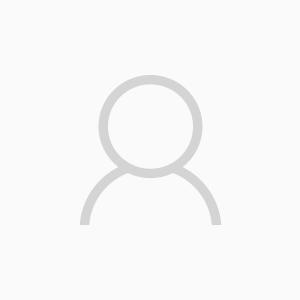 Deadline Day signing, Henry Ikeije sat in the revolving sub’s chair that, in previous weeks, had been filled by Jas Pattenden and Ty Mthunzi. 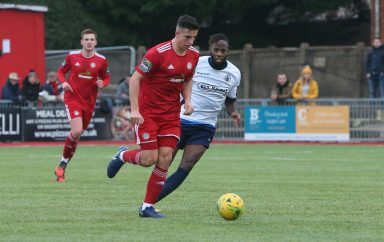 The home team made their intentions clear in the very first minute, as David Ajiboye’s shot rebounded out off a defender to Kwame Adubofour-Poku, who played a simple one-two with Ross Edwards. The fleet-footed attacker beat both visiting Captain, Alex Bentley and Kenzer Lee on a run into the box that ended with an emphatic finish into the top corner. Jalen Jones headed marginally wide from a corner before Jesse Starkey’s touch, turn and finish, as he expertly cushioned a long ball down from the back, brought the first of several impressive saves out of visiting ‘keeper, Chafer, with barely ten minutes gone. 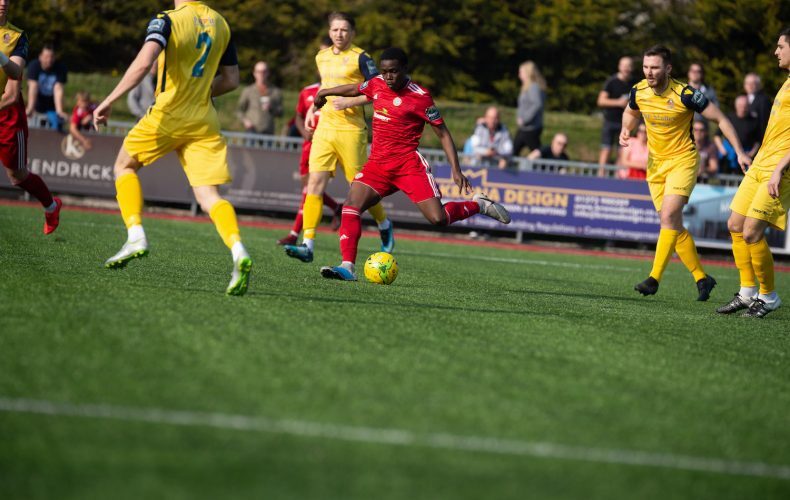 Reds continued to bombard last season’s North Division Champions and the dynamic duo of Jones and Starkey set-up goal number two for the high-flying hosts. The latter taking the former’s pass into the penalty area, where he was unceremoniously stopped by Glenn Wilson. Once again, Ajiboye stepped up to send Urchin’s purple-clad protector the wrong way, for his twentieth goal of the campaign. Our nippy Nigerian came close to doubling his tally, when Starkey played a right wing corner short to him and he fired narrowly over from the edge of the box. Lucas was busy getting onions on his half-time hotdog, when he had to return to the pitch to pluck the ball off the toes of Charlie Stimson, before returning to add a slither of ketchup. Ollie Pearce sparked the second-half into life early, by allowing Ricky Aguiar to find room for an effort that went just the wrong side of the right-hand upright. Then, from the opposite side, Ajiboye set off on a charge into the penalty area that ended rather tamely, with a shot straight at a relieved Chafer. While Pearce’s driving run from the halfway line saw him tease and torment Bentley and fizz in a cross that Starkey retrieved, only for his attempted pass to Aguiar to be intercepted by Stimson and the danger dispersed. We nearly had a goal-of-the-season contender moments later, when a whipped in delivery from the left came back out to a lurking Aguiar, twenty yards from goal, who let the ball bounce once before hitting a sumptuous, dipping volley that forced a busy Chafer to push over the bar two-handed. A breakaway on halfway lead to Starkey releasing an overlapping Ajiboye but he couldn’t keep his attempt down and, shortly afterwards, the same combination nearly bore fruit again, only for the ball to deflect behind for a flag-kick. Some tidy approach play saw Jones lay the ball off to Pearce and he drifted inside before unleashing an effort that Chafer got low down to save, at the expense of a corner. Five minutes later and the Essex-based club’s netminder pulled-off his best save of the contest so far, with a stunning one-handed stop to deny Kwame, after sub Budd had sprayed out wide to Pearce, hugging the left touchline and he beat Bentley, to tee-up the opportunity. With a little under ten to go, Jones thought he’d finally made the game safe when he headed Starkey’s left-sided corner down, textbook style, towards the back stick; only for Chafer to get there first and prevent the ball from sneaking in, with another piece of top-draw goalkeeping. The third goal did eventually come, when Starkey’s impudent backheel to the recently introduced Crane, on the overlap, was sent into the middle where Kealy poked home, despite the best efforts of a scrambling Chafer who, for once, couldn’t keep the ball out. 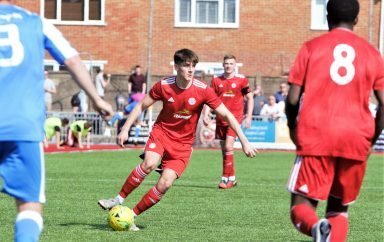 Stoppage time produced Hornchurch’s only serious effort on goal, as Joe Chrostou’s headed flick-on to substitute Saunders’ corner at the near post vetoed Covolan’s attempts to earn a third successive clean sheet. Sean Marks then had a great chance to make the game look a lot closer than it actually was, though he could only blast over when Lewwis Spence presented him with a free hit.